Falling asleep is easier. And I’ve decided that this is a state of being that I should be in more. It’s basically the only time I get a break from the pain. I’ve been bitching and moaning a lot, and will be for the next ever. Now don’t mistake my woe for mere hyperbole. Oh no, I am indeed in pain. I’ve been about at an 8 or above since the accident and the shock/embarrassment wore off. So 3 days of pain. Pain that’s been on the same severity. Pain that makes me want to stab my arm, or at the very least gnaw it off. I hate my wrist. I don’t want my wrist. I want a shiny new cyborg super wrist. It’s been like having a car park on your wrist for a few days… every once in a while some one gets in the car for a bit, maybe they have a party in there. Or it’s like getting your wrist smashed by a large sledge and then put into a vise. Not to mention this is the worse my paresthesia has been. I can feel all the painful muscle spasms. When I move it feels like things are hitting each other in there. 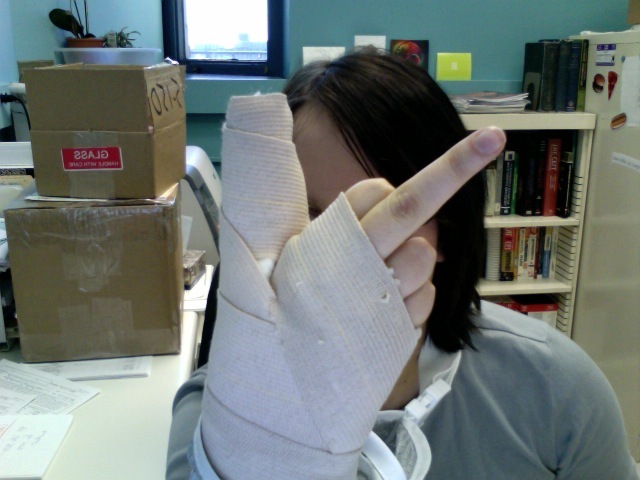 For 3 straight days of pain… I’m definitely irritable (more so than normal). I’m definitely finding myself trying to fight back tears. And I’m definitely ready for this to be over. For all this pain, there had better be something wrong. There has to be something to justify and for my mind to rationalize all of this. Otherwise, some one’s getting cast-slapped.